Beat the Mid- Week blues by playing at Thor Slots Casino during the happy hours and receive 10+ Free Spins every week. The happy hours at Thor Slots Casino are not limited to just an hour but last from 3 pm to 7 pm every Wednesday. All you need to do is login during the happy hours and claim a spin on the very rewarding Mega Reel. Up for grabs are free spins allotted on different slots plus amazon gift vouchers! Continue to read to know all the details about this offer! 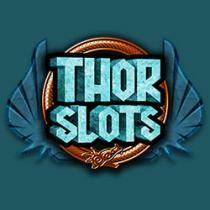 How Can I take part in the Thor Slot Happy Hour Promotion? Amazon vouchers as obtained via the Mega Reel spin will be emailed to the registered email address on your Thor Slots Casino account within 7 days. To be able to withdraw your winnings or any bonus funds, you must wager 65 times the amount of any bonus awarded. The following games do not contribute towards fulfilling the wagering requirements : Blackjack (all variants), Roulette (all variants), Video Poker, any other casino style games, Hi Lo games, Keno, Progressive jackpot slots. Real funds will be used prior to bonus funds for wagering purposes. The Mega Reel Spins are available only to players who have funded their accounts at least once since Monday this week. Under this promotion, the maximum convertible funds can not exceed £250. The free spins received as part of this promotion through the Mega Reel Spin will be given on a predetermined game as decided by the casino. No Mega Reel spin shall be awarded if depositing via the Quick Deposit option. Wins associated with Free Spins are credited to your account as bonus cash. Bonus funds are not available to be withdrawn whereas real money can be withdrawn subject to withdrawal policy. Bonus T&C : Daily cashback is calculated as a percentage of your daily deposits, minus withdrawals requested, minus any current balance in your account (00:00 to 23:59). Example, if you are a ‘VIP’ level player and deposit £200 during the day, you withdraw £50 and have £10 in your balance, your cashback amount is calculated as (£200 - £50 - £10) x 0.05. To claim your cashback, you must log in and claim via the ‘My Account’ page. Cashback awarded for the previous day's game-play is only available to claim until 23:59 on the following day. If you do not claim, your cashback total will be reset to the current day's total. The cashback amount is added to your account in REAL funds – with no wagering requirements or terms attached. If your account is closed, self-excluded or an a 'take a break', you will not be entitled to claim cashback. Regular site T&Cs apply. Sign up at Thor Slots Casino to Win a Free Spin on the Mega Reel & Claim Exciting Prizes! Apart from Thor Slots Casino bonuses & promotions, find other latest casino promotions ranging between No Deposit & Deposit Bonuses along with their bonus/promo codes here!